We offer instruction for both the novice and the experienced paddler. For the Novice paddler join us for a “Discover – Sea Kayaking” experience or an “Introductory Sea Kayaking course”. For those who have been paddling for a while, join us for a session on rolling, ocean rescues, navigation, tide & currents, GPS use and more. We provide fully catered tours and custom tours to kayaking locations around Vancouver Island. Tours are led by guides who have qualification, experience and a passion for the outdoors and paddling. At our waterfront location we carry and use products & equipment from Necky, Nimbus, Northwater safety & rescue equipment, Brooks, Seaward, Hobie, Scotty and other industry suppliers. We offer competitive prices. 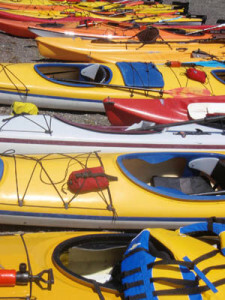 Our rental fleet consists of Necky and Seaward single & double kayaks, Hobie pedaling single & double kayaks. We rent by the hour or by the week. We offer discount evening rates, special LOW off season rates and frequent paddler discounts.